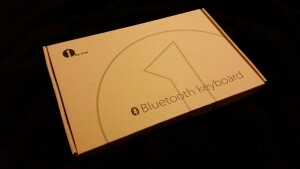 The 1byone keyboard is a slim low-profile bluetooth keyboard that features a multi-touch touchpad. I give this keyboard a 5/5 star rating because it works great for a light, portable keyboard. 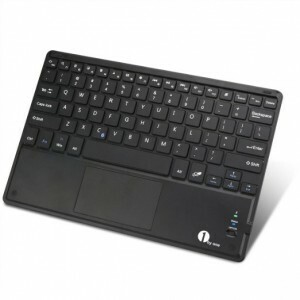 The 1byone Wireless Bluetooth Keyboard with Multi Touchpad is a great keyboard to carry with you on the go. I tested it using a Samsung Galaxy s5 (Verizon) running Android 5.0 and a Dell Latitude E6420 running Windows 8.1 x64. 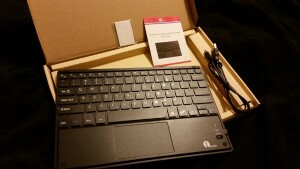 The keyboard does not come with a charging wall wort; however, it does include a micro USB cable that can charge the device by plugging into a laptop or computer. One setup note–the instructions say to press the connect button, really this means to press the Fn button and C button (Bluetooth icon) together. Other than that, connecting the keyboard to your phone, laptop, etc will be a breeze. The shift+left/right or up/down does not highlight as expected (like in Windows). However, this could be a limitation of the Android OS. You can use the touch pad to double-click a word to highlight it. The trackpad at the bottom of the keyboard works with both Windows and Android. I do not believe it will work with an iOS device due to Apple’s limitation; however, I did not have one to test with to verify. 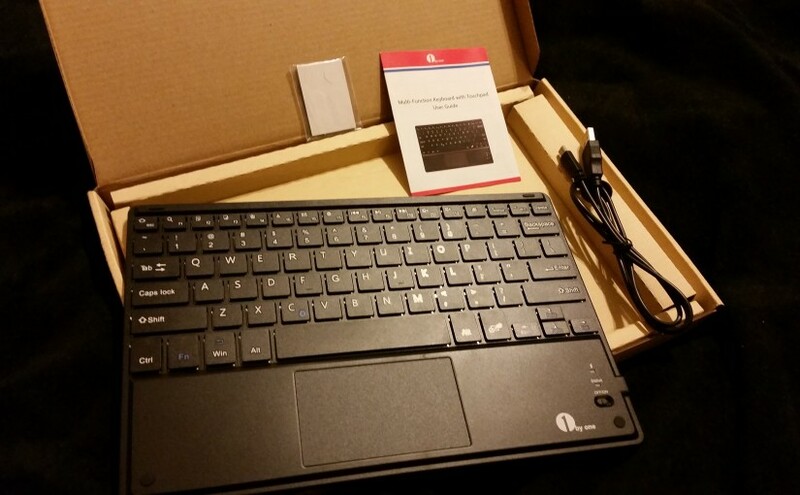 Head over to Amazon to pick up your own 1byone Wireless Bluetooth Keyboard with Multi Touchpad today! Built-in large touchpad with intuitive Windows 8 gesture support. Using the American Broadcom bluetooth 3.0 chip, 8 times faster than the Bluetooth 2.0, high-speed connection and signal distance up to 33ft (10m). Ultra slim design, easily stows in a backpack, messenger bag, or case. Ergonomic tilted design reduces wrist strain. 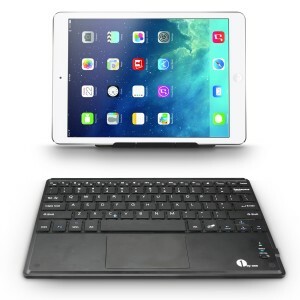 QWERTY layout with hot keys, compatible with iOS, Mac OS, Android, Windows, and all bluetooth-enabled tablets, laptops, and computers.